This shop has been compensated by Collective Bias, Inc. and its advertiser. All opinions are mine alone. 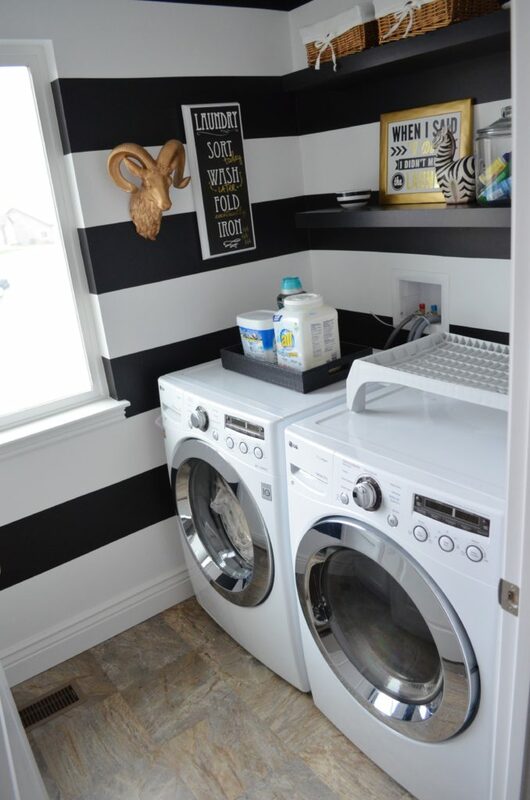 #allfreeclear #CollectiveBias We built our house just over a year and a half ago and after decorating my laundry room, I never got around to setting up organization systems. It was recently covered in piles of dirty laundry and linens, clothing that needs to be donated and piles of clothes that need patches and buttons to be sewn on. It’s safe to say that it had gotten a little insanely wild. Clearly, the whole “just throw your clothes, cleaning supplies, and linens in the laundry room” system was not working and I was left with piles, no counter space to fold and a huge mess. Now that spring is here, there’s no better time to implement some spring cleaning and organization hacks to get and keep this room nice and neat. I’m also staying on top of seasonal allergens by doing a deep-clean on all of my comforters and linens (especially for my sensitive-skinned toddler who was having issues after taking her blankie outside). I was able to clean out and organize this room while I did a HUGE laundry and Netflix binge washing all the blankets, comforters, linens. I stay on top of our families seasonal allergies and my daughters sensitive skin by using all® free clear Mighty Pacs®. I like using the #1 Recommended brand by Dermatologists, Allergists, and Pediatricians for a powerful clean thats 100% free of dyes and perfumes. Remember, these pacs are very powerful so you don’t want to over use the product by putting too much in one load, just follow the directions exactly. all® free clear is also hypoallergenic and clinically proven to be gentle on skin (disclaimer: all free clear is not intended to treat or prevent allergies). But still keep it in mind for spring cleaning/spring laundry to tackle the everyday cat and dog dander, dust mite matter, ragweed, grass, and tree pollen. Here are my three tips for tackling the organization of a laundry room. More piles? Stay with me here, as you can see the majority of the clutter is dirty laundry and linens, so separate them out into washable laundry piles. While you’re rotating through washing and folding the laundry piles, create a donate pile, a needing to be fixed/mended pile, a this goes into another room pile and a trash pile. Then make a new rule that you can’t dump things into the laundry room anymore (I’m totally guilty of this). I now have a box in the garage for donations, a basket in the craft room for items needing to be fixed or mended and some great systems for storing cleaning supplies. The main points are this: if it doesn’t belong in the laundry room, don’t throw it in there. One of my biggest problems was how little space I had on the counters (for effective organization) and in the small cupboard. I love the way I was able to create more space by using the vertical space and the laundry room door. I used an over the door organizer to store all of the cleaning supplies. This one clips right onto the door and has adjustable baskets for storing cleaning supplies. I also had one of these in my pantry for storing food items (it’s so versatile). I’ve also seen using an inexpensive over the door shoe holder to accomplish the same thing. I used a plastic bag holder to store towels for cleaning and adjustable wire shelves for hanging hand washables and socks needing a match. As you can see, this laundry room only has room for two laundry baskets underneath the counter. What works best for us is to keep those two baskets available for kitchen towels, napkins, table linens and bathroom towels and keep the other baskets in bedrooms. I will rotate those through and as long as I’m staying on top of the laundry the system works really well. In addition to folding on the back countertop, I’ll use the empty baskets to carry the clean laundry to a place where I can fold it and put it away, right away. I like the large, heavy duty container of all® free clear Mighty Pacs® found at Sam’s Club (because I prefer the container to a bag of the pacs). Make sure to follow them on Facebook here for more tips, tricks and coupons. What is your favorite laundry room organization hack? Love your blog and Insta! Love seeing advice that’s actually doable ? Thank you so much! This comment made my day!